Keith Jarrett, the 66 year-old jazz legend, opened his solo concert at Walt Disney Concert Hall Tuesday night by plucking on his Steinway's strings, avant-garde style. He closed the evening with a love letter to Los Angeles: "Somewhere Over the Rainbow," by composer Harold Arlen. A range of music, not quite jazz, rather, unidentified art songs, came between. The slow-tempo'ed ruminations clustered 'round the low notes of the grey-haired pianist's keyboard. Feeding a rhapsodic house of worshipful fans, Jarrett offered an assortment of repertory, all digestible, ranging from 8-10 minutes. "This is the new, short me!" he proclaimed in one of several appealing commentaries delivered from a standing microphone 10 feet from his piano. Jarrett is a highly introspective performer. Alternately hunched over the keyboard, then weirdly (and wonderfully) rising to standing position while still playing, he noodled and extracted harmonies. The slender pianist at times wrenched away from the keyboard, twisting his torso and turning his face to the house. Sometimes he wailed with his voice. Even boogie woogie, even walking blues, all that he touched was shapely and controlled. There was a sameness, at worst, but the evening came to a crescendo during three encores. Having been roundly warned by a stern voice on the P.A. system against talking, photo-taking, cellphone ringing, or the worst of all, god forbid, coughing, the muzzled audience nonetheless gamely drank it in. They seemed awestruck. In the end, they loudly demanded not one, not two, but three encores from Jarrett who charmingly offered the Arlen ditty as his farewell. The love connection between artist and audience was thus sealed. Along with his rapturous playing, Jarrett rapped. Getting the thumbs down was Kenny G; saxophonist Albert Ayler got a thumbs up. Jarrett admitted to having been self-indulgent in his salad days. Apropos his new-found musical brevity, he said, "When it's over, it's over!" 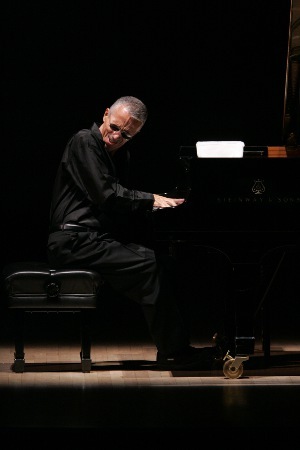 Keith Jarrett photo courtesy Los Angeles Philharmonic.